The Locations Tab allows you to see your the most current location of your devices. This page updates automatically and does not require any refreshing to see the newest incoming information. Filter Devices – allows you adjust which units are displayed by checking or unchecking as needed. This does not remove units from billing or turn the devices off. Please contact Support if you need to remove units from your account. The devices come pre-activated so they will display in your account right away and prior to installation will show the yellow Offline triangle as they will not be receiving power. As soon as the devices are installed they will register a location and status. You are able to toggle between Map or Hybrid (satellite) view using the button in the up left-hand corner. Next to this, you’ll find a box with 4 arrows. Clicking in this box enlarge the map to Full Screen view, hiding the data column on the left. Clicking this again will return the map to its default size. In the lower right-hand corner you’ll find 3 icons: Fit to fleet, Street view and Zoom In/Out. The map size can be customized by using the 3 vertical lines you’ll see between the map and the address on the left . Just click and slide in the direction you’d like. Left Clicking on the vehicle icon will produce the Info box, as well as automatically highlighting the vehicle on the list to the left. This info box will contain data such as device name, status, etc… There are three tabs to select from, which will show the data details. Right Clicking on the vehicle icon produces the ability to see current and historic trail lines. This is ability to see from Locations the travel history for the vehicle. Current Trail will highlight the most recent route on the map. Historic Trail provides a shortcut to a Single Day Trips Report, which is where multiple trail lines can be viewed at once. When the map is on Full Screen, you will still have use of the various features. In the upper left-hand corner, you’ll find a drop down to access the other tabs for the rest of the account. Down the left-hand side, you’ll find a pull out box with your device data (device, location, status, duration). Just click on the arrow to access. 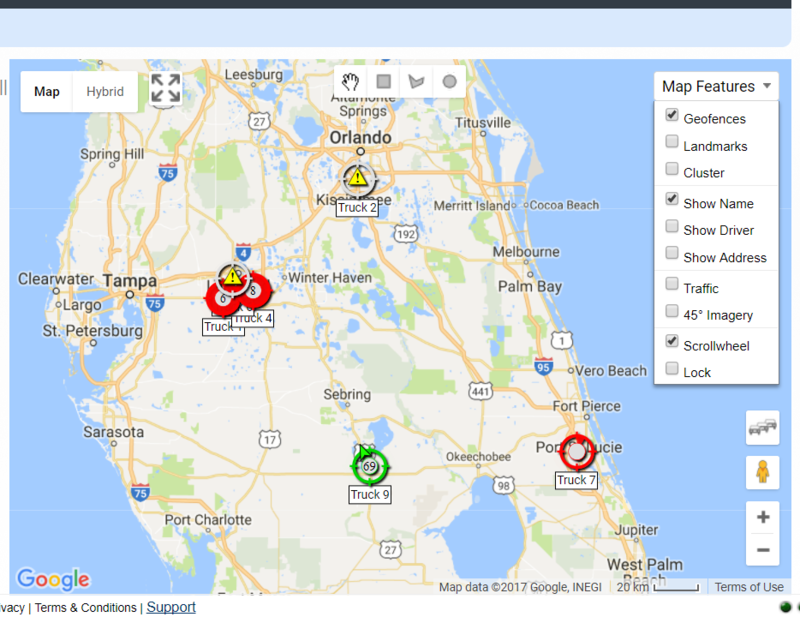 The Destinations feature allows you to send last-minute job assignment locations to your drivers. This is not to set a schedule for the day but rather to deal with emergent issues as they come up. Destinations is found in the sub-menu in the Locations tab. Here you can enter the address and click the “Find Nearest” button to find the closest vehicle to that location. The system will pull up 5 of your closest vehicles and display the distance to the address entered (in miles). Here you can select which vehicle you would like to send the information. You can send the address, turn-by-turn directions, and a message regarding that location. Just select the check boxes with what information you want to send and click “Save Destination.” This information will then be sent via text or email dependent on how you set up the driver profile assigned to the selected device. This link allows Diagnostic enabled units (those plug into the OBD II port of the vehicle) to display the read-outs directly on the Locations Tab for you to view. Simply click on the Diagnostics link, then select the desired vehicle. Clicking on Current will take you back to the regular Locations Tab. For further information regarding Diagnostics, please go to the Diagnostics section of this User Guide. Clicking on Current will take you back to the regular Locations Tab. For further information regarding Sensors, please go to the Temperature Sensors section of this User Guide.